Crack the number lock code. 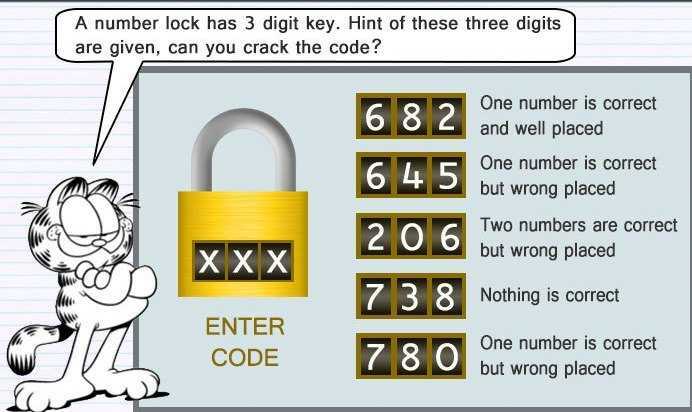 A number lock had 3 digit key.Hints for key are listed below. >> 6,8,2 - One number is correct and well placed. >>6,4,5 - One number is correct but wrong place. >>2,0,6 - Two numbers are correct but wrong places. >>7,3,8 - Nothing is correct. >>7,8,0 - One number is correct but wrong placed. From statement 1&4, one of 2 and 6 is right. From statement 1&2, 2 is right and is in the third place. 6 is wrong. From statement 3, 0&2 must be correct and 0 must be the first. From statement 2, 4 cannot be right. So 5 must be right and it should be the middle number. @Vontari Keerthana ,can you give explanation for your answer? From 1,3 lines 2/6 is correct. so From (5) 0 is correct but not in correct place. from (2) 5 is correct and not in correct place.